After an eighth-place finish in Canada at the 2017 World Juniors, Slovakia is hoping for much better results this time around in Buffalo. With the talent that they are presently considering to make the final roster, the Slovaks are likely to make those aspirations come to fruition. They have a far better roster than what most would realize – if Switzerland is the dark horse in Group B, then Slovakia deserves that moniker in Group A. They have a sterling array of players who are quite familiar with the North American game. Four OHL players. One apiece in the WHL and the QMJHL. Two in the NAHL and one in the USHL. And an NCAA goalie. Additionally, they back up those high-level players with equally satisfying talent from the European leagues, including their homeland and the surrounding countries. This is a darned good squad – one that may not vie for a medal, but certainly capable of improving upon last year’s finish. But then again, why shouldn’t they contend for a medal? They are a dark horse. Slovakia seemingly sweats “do not underestimate me” from their pores. They could make other teams pay dearly in Buffalo. Jakub Kostleny is the youngest and most diminutive of the three goaltenders on Slovakia’s preliminary roster. At 5-foot-9 and 154 pounds, he has played the majority of this season in Slovakia’s junior league. Kostelny has played in 13 games for HK Dukla Trencin, his hometown team. Through those games, he has garnered a 3.29 goals-against average and a .885 save percentage. Roman Durny has a bit more size to him. at 6-foot-1 and over the 200-pound mark, he is strong in net. Like Kostelny, Durny has spent most of his time in previous seasons playing for his hometown team, HK 32 Liptovsky Mikulas. Both for the junior level and the regular squad. Playing with HK 32’s big club in the Slovak Extraliga, Durny got into six contests with them last year. His numbers of a 3.71 GAA and a .864 SV% are fairly comparable to Kostelny’s. The difference is obviously between the size of the two goalies. Otherwise, they bring you about the same production. But the real bread-and-butter for Slovakia’s goal crease is Dávid Hrenák. Presently in his freshman year of NCAA hockey at St. Cloud State University, he has been phenomenal for the Huskies. It is a travesty that St. Cloud State does not garner the attention they deserve as a hockey school because Hrenák would be front and center of the NCAA game. In six games, he has a tremendous 1.82 GAA and a .947 SV%. The year prior, he manned the nets for the Green Bay Gamblers of the USHL for 33 games. His numbers were equally impressive with a 2.24 GAA and .923 SV%. Hrenák will be Slovakia’s starter and could see all of the action in the tournament for his country. It’s a tossup between Durny and Kostelny as backups. Defense is always interesting with Slovakia. At the 2017 tournament, they regularly skated eight defenders a game. Most teams go with seven, possibly even as few as six. Not many go with eight. Right now, they have 10 defenders on their preliminary roster. Only two were on the 2017 team. One of the returning D-men is Martin Fehérváry. This 6-foot-1 defender is draft eligible for 2018 and is likely to be taken within the first four or five rounds. This year, Fehérváry has been playing in HockeyAllsvenskan, which is the second-highest league in the Swedish ice hockey system. Last April, he captained Slovakia’s U18 team at the World Championships. With the captaincy vacant, Fehérváry may be the top choice to fill that role for the Slovaks. The other defender to be back here in 2018 is maybe their best. Martin Bodák plays in the Western Hockey League with the Kootenay Ice. In five World Junior games in Canada last year he scored a goal from the back end in the quarterfinals against Sweden, which Slovakia would lose 8-3. In 30 games for Kootenay this year he has scored a goal and 11 assists, to go along with 26 penalty minutes. If Slovakia does decide to go with eight defenders again, they may as well go with a trio that we will call “The Three Towers”. Vojtech Zelenak is 6-foot-5 and 225 pounds, Dusan Kmec is 6-foot-3 and 223, and the biggest of them all is David Matejovic at 6-foot-5 and 238. Good luck to the opposing teams trying to screen Slovakia’s goalie with these three on the ice. Kmec, obviously the smallest of the three, is maybe the most fierce. In 26 games this year in the NAHL that he has split between the Philadelphia Rebels and Aberdeen Wings, he has 58 penalty minutes. The other possible selections for Slovakia to make include Michal Ivan, Samuel Fereta, Tomas Hedera, Andrej Lesko, and Marek Korencik. Adam Ruzicka is easily Slovakia’s best forward. The fourth-rounder selected by the Calgary Flames this past summer has wonderful size at 6-foot-4 but also possesses some amazing puck-handling skills. 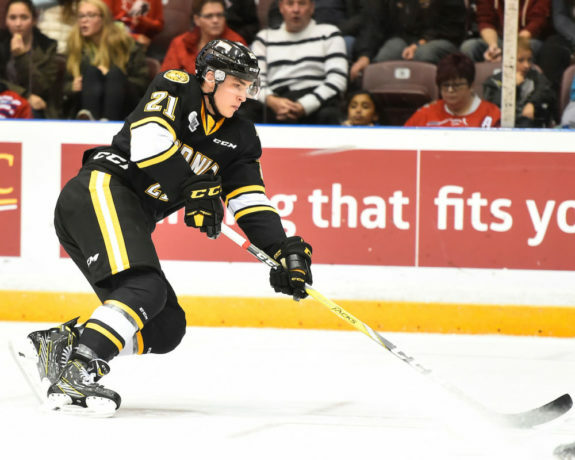 Ruzicka has had two amazing years with the OHL’s Sarnia Sting. Last year, it was 25 goals and 21 assists for 46 points in 61 games. This year, Ruzicka has scored 20 goals and 18 assists in only 33 games. He likely should have gone higher than the fourth round. Ruzicka will be the most enjoyable player to watch for Slovakia in Buffalo. Another NHL prospect who will make this team is New Jersey Devils selection Marian Studenic. The Devils took Studenic 143rd overall over this summer. This stems from the productive seasons he has had for the Hamilton Bulldogs, also of the OHL. In 88 games across two seasons, Studenic has 30 goals and 28 assists. This season, he is nearly a point-per-game player 28 points (12g, 16a) in 30 games. Milos Roman is another fine one to be watching for. He was on the 2017 World Juniors Slovakian team and had a goal and an assist in four games. This year is also his first in the OHL with the Vancouver Giants. Roman has had a similar season to Studenic, offensively. While he has a satisfactory eight goals in 32 games for the Giants, he has set up a good number of tallies for his teammates. Off of those finishes, Roman has assembled 21 assists. Our other forwards that could make the final roster are Vladimir Vybiral, Samuel Bucek, Viliam Cacho, Alex Tamasi, Samuel Solenský, Erik Smolka, Patrik Marcinek, Adam Liska, Peter Kundrik, Niki Jasko, Milos Kelemen, and Filip Krivosik. 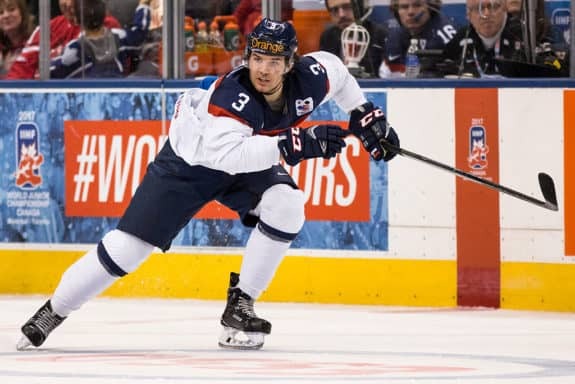 With the exception of Ruzicka and maybe Studenic, Slovakia’s firepower is not enough to pit fire with fire against the perennial powerhouse teams. That being said, they still have enough gun-slinging capability that any team will need to wary of their offense. Slovakia may have the best size and strength out of any team at this tournament. Teams like Canada and Denmark certainly have their fair share of big guys, but Slovakia is laden with them throughout the roster. It is rather impressive, actually. There is no sense in trying to out-muscle the Slovaks at this tournament. The best you might be able to do is keep them in check, with regards to physicality. The World Juniors in Buffalo could also be a coming-out party of sorts for Hrenák in net. While those already familiar with him know his capabilities as a goaltender, now he will be thrust into the spotlight for one of hockey’s biggest performances. Hrenák should draw a good amount of attention at this tournament. Goaltenders: Dávid Hrenák, Roman Durny, Jakub Kostleny. Defense: Martin Bodák, Vojtech Zelenak, Dusan Kmec, David Matejovic, Martin Fehérváry, Michal Ivan, Samuel Fereta. Forwards: Adam Liska, Viliam Cacho, Adam Ruzicka, Milos Roman, Marian Studenic, Samuel Solenský, Alex Tamasi, Samuel Bucek, Vladimir Vybiral, Erik Smolka, Niki Jasko, Peter Kundrik, Patrik Marcinek.